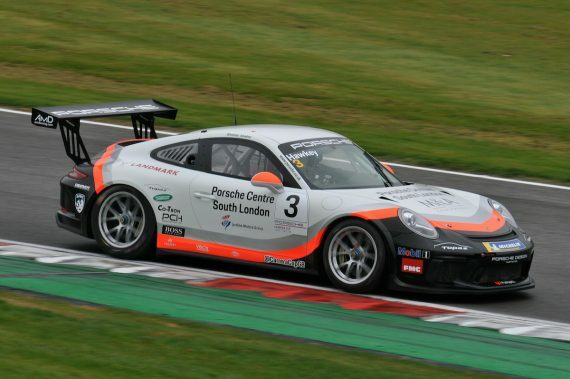 The weekend started with the Kent-based racer showing promising pace in both Friday free practice sessions, going fourth fastest overall in session one and fastest of the ProAm runners in both sessions. The weather on Saturday threw a curve ball when drizzle fell making the track slippery and tyre choices difficult to call. All the cars took to the track for qualifying on wet tyres but a small window opened up when the track was dry enough to run on slick tyres. Esmee’s run had put her second fastest but with others changing to slicks she fell down the order as they took advantage of the opportunity. Heavy fog delayed the start of the first race of the season but, starting in fourteenth place, Esmee was determined to rectify the misfortune of qualifying. Starting the race on slick tyres she put in a sterling drive, setting the fastest lap in her class in the process, to move through the field and finish in sixth place overall and second in class. Esmee started race two from the outside of the third row but unfortunately got bogged down at the start and lost ground to her rivals. With the track now bone-dry the racing was close, with little room for error. 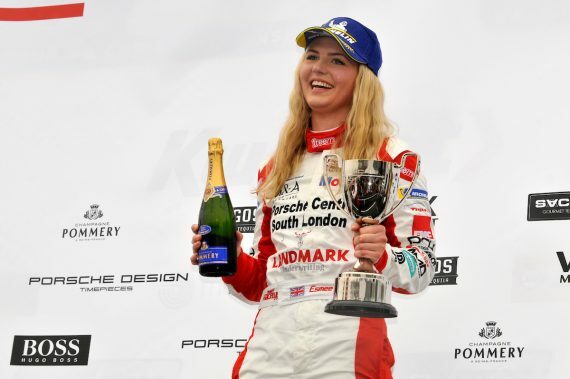 For the second half of the race Esmee formed part of a five-car gaggle that was inseparable, and, at the end of the 34 laps race, she crossed the line fourth in class, less than three seconds behind the ProAm winner. “Friday Free Practice one and two were really positive and we were P1 in the ProAm class in both sessions, so I was really happy with that,” said Esmee. “In Saturday qualifying the weather turned and it was miserable compared to Friday. We had the horrible spitty rain that was in the middle, halfway between wet and dry. We started on old wets for a run and then changed onto new wets and did a time that put us P2 when the track was at its wettest. After that there was a small window where people were able to run on slicks and we missed it which was unfortunate but that’s how it goes. “I wasn’t happy after qualifying, so we had a lot of ground to make up. Race one was similar weather, but we went for slicks, as most people did, and we went from P14 to P6 and we had some great racing. I kept it clean and pushed every lap and we ended up second in class. This entry was posted	on Wednesday, April 10th, 2019 at 9:00 am	and is filed under Featured, Motor Racing. You can follow any responses to this entry through the RSS 2.0 feed. Both comments and pings are currently closed.